Robert M. Carter, Ph.D. is a palaeontologist, stratigrapher, and marine geologist with a 50-year record of university teaching and publishing international research on ancient environmental and climatic change topics. Carter has acted as an expert witness on climate change before the U.S. Senate Environment and Public Works Committee; parliamentary select committees on emissions trading in Australia and New Zealand; and in a meeting in Parliament House, Stockholm, Sweden. He was a primary science witness in the Hayes Windfarm Environment Court case in New Zealand and in the U.K. High Court case of Dimmockv. H.M.’s Secretary of State for Education, the 2007 judgement that identified nine major scientific errors in Al Gore’s film An Inconvenient Truth. It is with great pleasure The Heartland Institute presents Dr. Robert Carter with the Lifetime Achievement in Climate Science Award. NOTE: Robert M. Carter, Ph.D., a long-time policy advisor to The Heartland Institute and a world renowned authority on climate change, passed away on January 19, 2016. He was 74. The family of Robert Carter asks that contributions in his memory be made to The Heart Foundation. A tribute to Dr. Carter by Heartland Institute President Joseph Bast, and many friends, can be read below. BIO: Dr. Carter was a palaeontologist, stratigrapher, marine geologist and environmental scientist with more than 30 years professional experience. He earned degrees from the University of Otago (New Zealand) and the University of Cambridge (England). He held tenured academic staff positions at the University of Otago (Dunedin) and James Cook University (Townsville), where he was Professor and Head of School of Earth Sciences between 1981 and 1999. Dr. Carter served as Chair of the Earth Sciences Discipline Panel of the Australian Research Council, Chair of the national Marine Science and Technologies Committee, Director of the Australian Office of the Ocean Drilling Program, and Co-Chief Scientist on ODP Leg 181(Southwest Pacific Gateways). Dr. Carter was one of the world’s leading authorities on the science of climate change. He was the author of two books on the subject, Climate: The Counter Consensus (2010) and Taxing Air: Facts and Fallacies about Climate Change (2013) and coauthor of several more, including three volumes in the Climate Change Reconsidered series produced by the Nongovernmental International Panel on Climate Change (NIPCC) and published by The Heartland Institute. Shortly before his death he coauthored Why Scientists Disagree About Global Warming (2015). Dr. Carter’s public commentaries drew on his knowledge of the scientific literature and a personal publication list of more than 100 papers in international science journals. His research on climate change, sea-level change and stratigraphy was based on field studies of Cenozoic sediments (last 65 million years) from the Southwest Pacific region, especially the Great Barrier Reef and New Zealand. Dr. Carter acted as an expert witness on climate change before the U.S. Senate Committee of Environment & Public Works, the Australian and New Zealand parliamentary Select Committees into emissions trading, and in a meeting in parliament house, Stockholm, Sweden. He was also a primary science witness in the Hayes Windfarm Environment Court case in New Zealand, and in the U.K. High Court case of Dimmock v. H.M.’s Secretary of State for Education, the 2007 judgment which identified nine major scientific errors in Mr. Al Gore’s film An Inconvenient Truth. Dr. Carter’s research was supported by grants from competitive public research agencies, especially the Australian Research Council (ARC). He received no research funding from special interest organizations such as environmental groups, energy companies or government departments. On March 3, 2015, Dr. Carter authored a lengthy correction of the scurrilous attacks by the environmental left against his friend and honorable colleague Dr. Willie Soon. Read it here. It is with deep regret that I report the passing of a friend, colleague, and great scholar, Dr. Robert M. Carter. Bob died peacefully in a hospital surrounded by family and friends following a heart attack. He was 74 years old. Bob never failed to answer the call to defend climate science, getting on planes to make the long flight from Australia to the U.S., to Paris, and to other lands without complaints or excuses. He was a wonderful public speaker and a charming traveling mate. He was not an easy man to edit, though – he kept wanting to put unnecessary commas, “that’s,” and boldfacing back into his manuscripts – but the great ones never are. Bob helped immeasurably with three volumes in the Climate Change Reconsidered series, a series of hefty compilations of scientific research he coauthored and coedited with Craig D. Idso and S. Fred Singer. Just a few weeks before his death, Bob flew to Paris to speak at Heartland’s “Day of Examining the Data” and contributed to the completion and review of another book, Why Scientists Disagree About Global Warming: The NIPCC Report on Scientific Consensus. We honored Bob with a “Lifetime Achievement Award” at the 10th International Conference on Climate Change (ICCC-10) in Washington DC last June. I regret that I missed that event due to the sudden onset of shingles, and so missed the opportunity to see my friend as well as publicly recognize his great achievements in science. Please remember Bob and his wonderful wife, Anne, in your thoughts and prayers. I first met Bob some 53 years ago. The year was 1962. He was a 3rd year honors geology student at Otago University in Dunedin and I was doing 1styear geology as part of a mining engineering degree. I got to know Bob quite well since, being one of the most dynamic and enthusiastic of the senior students, he was asked to assist the teaching staff on 1st year geological field trips. One early memory is that Bob, in addition to his geological skills, was able to roll cigarettes with one hand while driving the departmental land rover with the other. It was obvious early on that Bob had a passion for fieldwork on soft rocks and fossils and this was a love that never left him. And talking of love, Bob began courting a beautiful young arts student from Invercargill with the name of Anne Verngreen. And as luck would have it and quite independently, I started courting an equally striking young science student with the name of Helen Verngreen – Anne’s younger sister. Bob and Anne graduated in 1993 and shortly thereafter married. A few months later they set off for England where Bob, with a commonwealth scholarship tucked in his pocket, started a Ph.D. on “Functional Studies of Bivalvia” at Cambridge. Anne took a teaching job at the Bell School of Languages to help keep Bob in red wine. Meanwhile Helen and I graduated and also married and two years later we arrived in London where I started a Ph.D. at Imperial College. It wasn’t long before we met up with the Carters again. A deciding moment, or I should say deciding month, came along as the four of us embarked on a four week long camping trip to Scandinavia. Needless to say we all got along swimmingly and this experience cemented a close and valued friendship that has continued to this day. We have several memories of this trip and here is one. It was in a forest in southern Sweden infested with hordes of tiny biting flies known as “noseums”. Bob and I, being true gentlemen, retreated to the tents to smoke and drink beer in a valiant attempt to keep flies at bay – while the ladies stayed outside to cook dinner surrounded by clouds of the nipping insects. Boy, we never quite lived that down. After Cambridge Bob and Anne returned to Otago University in Dunedin where Bob was appointed a Lecturer in Geology, and in the years that followed two bright young children came along – first Susan and then Jeremy. And so our lives diverged once again. I became an exploration geologist in the mining industry, started work in the U.K. and in the early 1970s we moved to the U.S. Along the way Helen and I also came up with two children in the same order – first a daughter and then a son. Over the decades that followed we shared many adventures and family gatherings with the Carters – in NZ, Australia and the States, and on several occasions we had the three sisters – Anne, Helen and Clare – present with their families. Bob liked to refer to the sister trio as “The Three Graces” – which of course they all lapped up. During one visit by the Carters to Denver, where we lived at the time, Bob and I spent an exciting day looking at the spectacular geology along the Front Range of the Rockies but on the drive home we were stopped by the county sheriff amidst a flurry of sirens and flashing lights, ordered out at gun point and told to stand at the back of the car with our arms raised high while they searched the vehicle. Fifteen minutes later we were told to stand down since they had nabbed the bearded purse snatcher at the same quarry where we had looked at the rocks. The two innocent but frightened geologists breathed a sigh of relief and headed home for a very stiff single malt scotch. Bob was a great travelling companion and he was a huge fund of knowledge whether it be sports, arts, politics, science or gadgets. He and I had an easy going relationship and were frequently bragging and debating as to whom had the longer telephoto lens, whose binoculars were better, who was the better birder (he won hands down), pcs versus macs, who had the best single malts (I won that one) and other subjects that are not appropriate to mention here. He also liked to quip that I was the Economic geologist while he had to settle for being the family Uneconomic Geologist. Bob had a very distinguished teaching career at Otago University and JCU which spanned some 30 years. And not surprisingly he left his mark for the better at both institutions. Bob always retained a passion for fieldwork but his own interests broadened and expanded with time especially into Marine Science. He participated in several scientific cruises both in New Zealand waters overlying the continental shelf with NZ based groups and in the southern Pacific with the big time, Ocean Drilling Program research ships funded by the U.S.
Over the last 15 years, as we all know, he has been increasingly involved with climate science and the climate record, both recent and historic, much to chagrin of the believers and large segments of the academic community that preach free speech and tolerance but act otherwise. Whatever Bob tackled, he did with gusto and focus and incredibly hard work – and he invariably excelled. But somehow he always made time for home projects including his recent marathon genealogy study covering all sides of the family. However, without the dedicated help and support from his loving wife Anne, Bob’s endeavors may not have reached the heights we have witnessed. Anne often recounts the many times she was on her hands and knees bagging and labeling fossil specimens in such exotic locations as vineyards in France, precipitous slopes in the Dolomite mountains in Italy and hot, dusty deserts in Turkey. Anne’s knees tell the story! Over his 50-year career of teaching, research, lecturing and academic leadership, Bob has traveled the world, often with Anne and their two children (when they were younger) by his side. He has studied, done field research and/or lectured in Australia and NZ, the UK and most of Europe, North and Southern Africa, parts of the Middle East and Asia (including Japan and China), Antarctica and across the U.S and Canada. His scientific papers are almost endless and he wrote and had published two climate books to boot. What energy that man had! Not many of you may know that at the tender age of 21 he joined a scientific expedition to Pitcairn Island and was the first ever geologist to map that remote terrain. Rumor has it that he also acted as part time cook on the island. That’s Bob Carter! Over the years Bob has mentored 100s of students, has been honored with many awards and, judging by the avalanche of tributes that have come in over the past week, he is renowned, respected and loved across the globe. Helen and I accompanied Bob and Anne to three International Climate Conferences in recent years where we witnessed first hand Bob’s extraordinary reputation amongst his peers. At the Heartland Climate Conference in Washington DC in June last year he received the prestigious Lifetime Achievement Award. That was quite an emotional evening for us all. To sum up, Bob has had a distinguished and very productive academic career, supported by Anne and family, and as our brother-in-law and long time friend and the uncle to our children, he has always been a stimulating companion and mentor. Our eight year old grandson likes to call Bob “Uncle Fossil”. His family, relatives and friends will all hugely miss Bob’s quick wit, the twinkle in his eye, his mischievous grin, his infectious laugh, his generosity and gentle nature, his sense of fairness and, above all, the sheer pleasure of his company. I feel so privileged to have known and worked with Bob (since our 2006 voyage in the Baltic) and to have shared the panel talks last month in Paris. It is with a sad heart that I note the passing of my dear friend and colleague Bob Carter. Bob suffered a heart attack over a week ago and today (Jan 19), surrounded by family, he passed on from this mortal life. He was 74 years old. I had the privilege of knowing and working with Bob for the better part of the past decade. Along with Fred Singer, I served with Bob as a Lead Author on several volumes of work produced by the Nongovernmental International Panel on Climate Change. Putting together those volumes was always a Herculean task and Bob was an integral part of their success. He was a master of scientific knowledge and had an incredible talent of sharing that knowledge with others. Bob had a long and storied career. A wonderful biography of his accomplishments can be found here. But for those who knew him best, it was not his career that kept his heart, but his dear, sweet companion Anne, who was always at his side and accompanied him to nearly every work-related conference and meeting he attended. I will miss Bob and the friendship we shared. To Anne and their family, may God bless and be with you during this difficult hour of your lives. You have our heartfelt condolences and are in our prayers. Bob was a true gentleman scientist, and a friend and colleague who will be sorely missed. Bob gave everything he had in trying to educate the world on the danger of the CO2 scare, and was a true champion of science. Personally, he has taught me many, many things on Earth sciences. Knowing and working with him has to be among the most-special and happy times I have experienced in science. 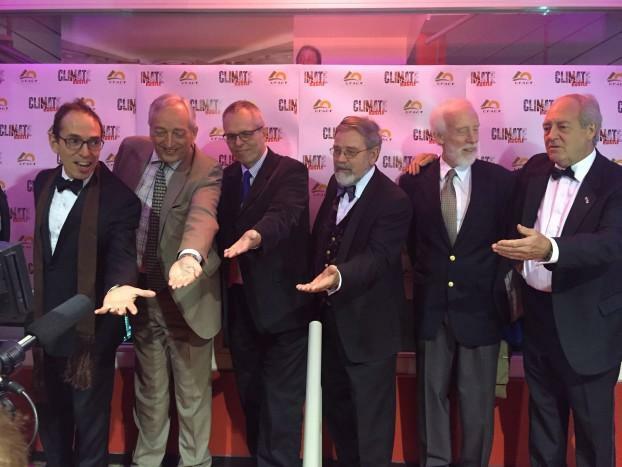 From left: James Delingpole, Christopher Monckton, Christopher Essex, Bob Carter, Tom Harris, and Patrick Moore at the premiere of “Climate Hustle” in Paris, 2015. We all loved Bob; we’re all going to miss him. He smiled as he fought and as Fred says he died with his boots on. What those of you who missed hanging with him in Paris last December (that’s him, third from the right at the premiere of “Climate Hustle” in Paris) should know is that he was on splendid form – hail, happy, looking like he was going to go on forever. Good old Bob with his dark Satanic beard and his impish smile. What a hero! What a friend! Just the kind of guy you want in the foxhole next to you! I met Robert Carter first through correspondence, finding him always ready and patient to educate me, a non-scientist, on the ins and outs of climate science. Over the past few years, largely through Heartland’s International Conferences on Climate Change, we got better acquainted, indeed became friends, and I benefited even more from his wisdom. I was particularly grateful for his generous gift of time when I interviewed him for our video documentary Where the Grass Is Greener: Biblical Stewardship vs. Climate Alarmism, for which his comments were clear, focused, and eminently helpful to the intended lay audience. He will be sorely missed as a scholar, a gentleman, a responsible citizen, and a keen scientist. His passing is a great loss. All Bob wanted in climate debates was common sense, repeatable validated evidence and scientific reasoning. He was not prepared to accept a popular concept, poor reasoning or concocted statistics and valued validated evidence over models. He was fearless and suffered because of it. He dared to use scientific training to analyse and criticise claims made by taxpayer-funded global warmists. In response to numerous crank calls, political pressure and complaints from those with vested interests, JCU withdrew his office facilities, unpaid adjunct professorship, his email address and library access. The bureaucratic and academic pygmies were tired of having to answer questions from the public and disposed of the person who gave them great public profile. They were tired of orchestrated complaints about Bob’s writings and lectures on climate change and could not handle the person who showed that polite argument against poor science and reasoning can defeat politicised science. JCU found it easier to blackball the person who had built up the discipline of earth sciences. It was not that Bob had his facts wrong but he was politically incorrect and his “views on climate change did not fit well within the School’s own teaching and research activities”. JCU clearly supported proscribed bespoke grant-attracting science and was uncomfortable with vibrant debate, scientific truth, academic freedom and great thinkers. They dismissed the person who put them on the map, Bob took this in good humour and would not be drawn into the petty quagmire of climate vulgarity. Bob was a gentleman of passion, a fighter and died with his boots on. We all owe him a great debt of gratitude and it was a privilege to know such a great man. We will miss him terribly. His wife Anne was always at his side and supporting him and our condolences to Anne and their family. 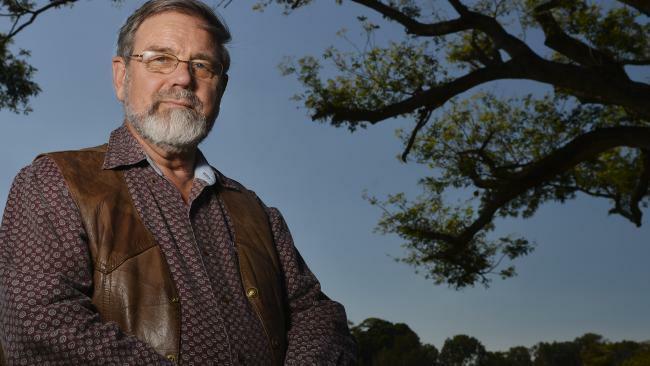 The Australian scientist Bob Carter died far too young. The climate change orthodoxy can be a tough proposition to be sceptical about if you mind being accused of betraying the future of the human race. Carter knew how to maintain a gentlemanly vocabulary even when the guardians of dogma were calling him names. It’s a hard trick to work: sometimes it’s just easier to join in and call your persecutors intensely dense. But Carter always behaved as if they might have had a point. Perhaps he was working on the principle that politeness is an argument in itself. Bob was a fine man, an outstanding scientist, and one of the leading climate realists in Australia and the world. It was my good fortune to get to know Bob and his wife Anne over the last decade when he came to America to speak at Heartland’s climate conferences. He was in good form at Heartland’s conference in Paris on 7th December. I and many, many people around the world have lost a good friend. The Cooler Heads Coalition has lost an esteemed ally. May he rest in peace. Bob and I were accidental coauthors but intentional partners in some climate adventures, with more than one scheme cooked up between us over the years. He was such a kind and generous man, liberally acknowledging the accomplishments of others. He once exclaimed, “Thank God for the Royal Canadian Mounted Skeptics!” in recognition of the contributions of climate skeptics from one of the three best countries as he reckoned things. Those who knew him well can figure out the other two. I know that one of his greatest wishes was for humanity to snap out of the social fever dreams wracking the civilized world. Last summer we started to cook up a scheme to give some of the enfevered an opportunity to see with their own eyes what real climate change actually is, through a field trip to the “Trubi Marls Successions” of Sicily. Naturally, according to the plan, the good Professor Carter would have been our teacher. I am so sorry that this act of scientific realism could not be realized, and I deeply regret that he did not live to see our cultural illness break. Bob was a splendid man with an inquiring mind. Last year, when we conversed on hypothesis testing, he stated that many scientists consider one hypothesis at a time, where he, as a geologist, may entertain several. There was no limited thinking with this singular man. What a great professional and personal loss for so many of us AGW critics. Bob gave so much of himself in recent years to holding the line against the false arguments and propaganda that has been so extensively advanced by global warming advocates. We should all admire Bob’s courage and his insightful climate understanding which he so skillfully brought to bear to up-hold the integrity of science. He leaves behind a most admirable legacy which will continue to inspire me and I’m sure many others to keep up our efforts to bring truth to the warming question. We will remember him. He was our clearest voice of truth. Bob Carter was a shining light to those of us in Australia who benefitted from his leadership in the Earth Sciences. A great geologist, a sound scientist, a good friend, a superb speaker and illustrator, the sort of pedantic editor I appreciate, and good company. His leadership and advice in the great climate debate will be sadly missed, especially here in the Sunshine State [Queensland, Australia]. Professor Carter was a very fine man — compassionate, intelligent and still hard working long after most people have retired. He will be sorely missed by many people. Bob was a great supporter of me and the International Climate Science Coalition in general, helping providing the solid, rational science foundation to our work to bring climate realism to the general public. I feel privileged to have known Bob in the last few years of his life. I also feel privileged to have spent some time with him in Paris, DC, Chicago, NY and here in Ottawa when he was on a speaking tour of Canada. Bob Carter’s sudden death reminded me that life is tenuous, and that what we view as firmament can be taken from us in an instant. I traveled with Bob in Australia during my tour in 2010. To say that he was a man of good cheer and resilience would be an understatement. He not only bore the slings and arrows thrown his way by some of the ugliest people in the climate debate, he reciprocated with professionalism and honor, refusing to let them drag him into the quagmire of climate ugliness we have seen from so many climate activists. Bob worked hard to dispel scientific ignorance, and to do it with respect and good cheer. We’ve all lost a great friend and a champion of truth. Bob was a man of great courage, intellect and wit. I am deeply saddened by his passing. He easily seemed a decade younger than his 74 years with his youthful looks and energy level. the world of science has lost a true champion. I first met Bob when I invited him to speak at the U.S. Senate Environment & Public Works Committee hearing on climate in December 2006. Bob’s full 2006 testimony here. Bob was amazing in Paris, good humored and adeptly handling the media and protesters. My thoughts and prayers go out to his wife Anne and his family and friends. He will be sorely missed. It says a lot about the man that, despite the obstacles, he didn’t seem bitter and rarely complained. He dealt with it all with calm equanimity. Somehow he didn’t carry the treatment as excess baggage. Bob Carter was a great man. His greatness was located in something that we all recognized; his intelligent courage , perceptive kindness and an exuberant love of life. Here was a man who showed everyone how to stand up to bullying and cowardly malice with elegant dignity. I think he understood human weakness without cynicism but he was baffled by the evasiveness of his opponents in the climate debate.How could they not see the truth, and why wouldn’t they face him openly? He felt that tribal allegiance or group think anxiety were at the heart of what passes for thought in our society. Ingrida and I are grateful to have called Bob and Anne our friends. A conversation with Bob could range from politics to science and fine art. He always had sympathetic care for family life. In fact he seemed to have a loving embrace for us all. He will be missed dreadfully by all who knew him. Our sincere commiserations to Anne and family, from John and Ingrida Spooner. Bob Carter was a gentleman and a scholar. With his wife Anne and his family, together they were one of New Zealand’s and Australia’s (Townsville’s) great treasures. A scientist to his very core and a scholar, who shone his light on his students and those with whom he worked, Bob was no ordinary Professor. A world renowned geologist who worked on many of the big issues in geological measurement and analysis, as well as the small local problems, he gave of himself in every way possible. Bob arrived at James Cook in 1981 when, as then Dean of Science, I had the privilege of welcoming him to our Science Faculty. Inheriting a well established and vibrant Geology Department, Bob very rapidly made further significant developments which enhanced his department, the image of Geology in Australia and James Cook University. Continuing with enthusiasm throughout his career, Bob moved into a new forum in retirement in which his goal was to restore integrity to science in general, where imposters had torn down its very fabric through promotion of the popular fallacy regarding the influence of carbon dioxide in causing increased Global Warming. The ideals of Copernicus, Galileo, Newton, Einstein, Schrodinger and thousands of others, were in shreds because of greed, stimulated by the prizes of research funding to be awarded to those whose science was weak and whose integrity was weaker, all in the name of a political fantasy, but upon which fed an incresingly hungry industry – “Climate Change”. Bob Carter stood out and will continue to stand out for many decades, as one whose retirement was given over to hard work in speaking the truth and encouraging thousands of others to do so. For his unswerving courage in the face of denigration by those whose understanding of science is wanting, for his good humour, for his encouragement to others, his clear and accurate presentations of the facts, we owe him a debt of gratitude May he rest in peace and may his family be comforted by the knowledge that their husband and father has touched so many in a world wide community of genuine friends. May God Bless them and keep them. The first climate skeptic gathering this journalist attended was a 1-day event in 2009. There were numerous speakers, but Bob Carter’s calm, sensible, persuasive presentation was the one I most talked and thought about afterward. (In 2012, I recalled that event here). Having shared a stage with Bob twice in the past six months, I can say with perfect sincerity that he was kind, charming, and a gentleman. He was always full of good cheer, despite continuing provocations, and unfailingly encouraging. I was profoundly saddened to hear the news of the passing of Dr. Robert M. Carter. He attended the climate conference in Beijing and gave us a splendid talk last year. We will miss and remember him. I was saddened to hear the news of the sudden death of my colleague and friend Bob Carter. Bob was a straight shooter, wholly intent on seeking the truth and sharing his understanding with others. He will be sorely missed. It is up to those who remain to keep up the struggle for rationale policy and politics. Bob Carter was a scientist of integrity and scholarship. He epitomized everything that was good in science, following the evidence wherever it might lead. Through his many presentations and publications, he exposed the fraud behind the mantra of catastrophic anthropogenic global warming. I have no doubt that his name will be writ large in the future record of what is proving to be the biggest fraud in the history of science. Bob will be missed and I offer my condolences to his family, colleagues and friends. The reality is that no scientist on the planet can tell you with credible probability whether the climate in 2030 will be cooler or warmer than today. In such circumstances the only rational conclusion to draw is that we need to be prepared to react to either warming or cooling over the next several decades. He was pleased by the success of our book, and I was hoping to see him somewhere en route during my Aussie tour next month. A great scientist and a courageous and honorable man, he was full of joy and steel-spined, exactly the chap, as James Delingpole said, “you want in the foxhole standing next to you”. Professor Bob Carter had guts. He followed the evidence and not the crowd. He identified the pause in the warming and was abused for it by many on the media, and only years later did the Intergovernmental Panel on Climate Change concede there had indeed been a hiatus. Carter was a seeker of truth, so it is a great blow that this fine man has died of a heart attack. … There are many people who call themselves scientists who follow the grants, the political drum and the media plaudits. Then there are those with the right stuff. Click here for video of one of Bob’s appearances on The Bolt Report. Almost everything I know about the climate and the scientific method I learned by listening to Bob Carter — and not just from his many excellent lectures. I was among the lucky ones. I got to spend quite a bit of time traveling with Bob, dining with Bob, and sharing a pint with Bob — though he always chose an excellent red wine for himself. Bob and I would frequently converse via email about how to best communicate the non-alarmist, data-based truth about the climate — how to break through the unscientific noise that dominates the mainstream media. I valued all that advice because Bob was among the world’s most successful communicators about the climate, as his opponents in the debate would attest. Many of his “official” presentations, and private conversations, will inform my thinking and communications for the rest of my life. I was fortunate to be able to call Bob a friend. I will miss him, his stories, his laugh, and his unflappable good cheer. Truly sorry to hear of his passing. My thoughts and prayers are with his family. In my limited personal experience with him, he was a pleasure to work with and was a brave man who followed the science where it led even at the risk of character assassination by his critics. When Dr. Carter received his “Lifetime Achievement Award” at the Heartland Institute’s 10thInternational Conference on Climate Change (ICCC-10) in Washington, DC last June, it was my privilege to be present to see and hear and applaud this remarkable man. He left us a treasure of great thoughts, honest science and remarkable courage in a troubled world. Thank you, Bob Carter. May you rest in peace. I’m still in shock – the news was in the first email I saw this morning and left me reeling. I shall raise a glass of red wine (Bob’s favorite) this evening to a wonderfully rational, sensible scientist and dear friend. All who care to do the same, around the world (whatever your time zone), are welcome to join me in saying goodbye to Bob. He will be sorely missed. Besides being possibly the warmest person I have ever had the pleasure of meeting, Dr. Robert Carter was truly the greatest scientist of my lifetime. And that is saying a whole lot. May God Bless his family in their time of sorrow and may we always put to use the gifts he gave to us in his incomparable lectures and presentations which dripped logic and reason with every spoken word. This ferocious warrior of truth and logic will continue to impale the charlatan opportunists that have overrun our government institutions and universities across the globe. Dr. Carter, like many other of the “celebrity figures” on the skeptic side of the CAGW issue, was a person who not only shared his time to his famous fellow skeptics, he also gave time to ordinary citizens. In my case as recent as just two weeks ago, we exchanged emails over a situation in Australia where I was already in the process of alerting a prominent public individual there to the existence of skeptic climate scientists and the depth of their climate assessment reports, of which that person seemed totally unaware of. Dr Carter ultimately took my suggestion to contact that person as well, lending science credibility firepower to my effort. I am indebted to him for extending that favor to me, and for the prior correspondences I had with him. He will be truly missed. My biggest memory of Professor Carter was he was the person who first turned me into a passionate and unapologetic AGW skeptic. This was the result of a talk he delivered one day in the late 1990s at the CSIRO in northwest Sydney. In this convincing talk, he had that rare combination of being at the same time rigorous yet engaging as well as critical yet positive. This news brings tears to my eyes because Bob was the epitome of a real scientist. His logic was beautiful and his experience and contributions unique. His defense of Willie Soon was remarkable. Best of all, Bob was a warm and generous human being who refused to capitulate to political pressures, insults, and assaults on his livelihood without showing bitterness. I once heard Bob say that a remarkable thing about our country was that an ordinary man could still afford to buy 40 acres and live free. I once presented Bob an underwater photograph of a threatened species from his part of the world, the sweetlips snapper, so he would not feel alone. I watched videos of Bob presenting the geological and paleontological evidence that there is nothing unusual or dangerous about our ideal interglacial climate today. I listened to many of his presentations at international conferences on climate change, and was humbled to share the dinner table on more than one occasion. Bob was fearless, while at the same time courteous and respectful. Bob has been a powerhouse in the man-made climate change debate. He had an unbridled energy and sharp intellect. His contributions to New Zealand and Australian geology were impressive. He has made huge contributions through research and teaching. These have been recognized by many awards. To mention just one: the Outstanding Research Career Award of the Geological Society of New Zealand (2005). Notwithstanding this record he has been vilified for his activities as a man-made-climate-change realist (sometimes called sceptic). But he has fearlessly defended the scientific method, against the subversion of that method by the man-made global warming activists. His death is a huge loss to his family and to science. But such was his generosity of time and knowledge, we have the tools he passed on to carry on the fight. I became involved with climate change issues, entirely by accident, at the end of 2002. A year or so after this event, as my acquaintance with the subject broadened, I became aware of Bob Carter’s writings, and I was impressed. I marked him down as an author to be followed. It was not until 2006 that we met, through an initiative on my part. At the end of 2005 the Stern Review was published. I felt that it deserved a comprehensive critique, and so far as the economic aspects were concerned a team of potential authors was already to hand. Well before the Review appeared, Sir Nicholas Stern (as he then was) had given a public lecture the text of which was published (together with an annex on climate science). I put together a team of nine economists, and we published in the journal World Economics (June 2006} a short critical article entitled ‘Climate Change: The Stern Review “Oxonia Papers”’. Alongside our piece there also appeared a reply by Stern. For the Stern Review itself, the journal accepted my suggestion that it should publish two critical review articles, separate but linked, one contributed by our team of economists and the other by a corresponding group of scientists. The problem then was to put together this latter team. It was in this context that I first met Bob. On learning that he was due to attend a conference in Stockholm, I wrote to suggest that we should meet in London during a stopover on his return journey. Happily, it proved possible to fix such a meeting, and over an extended Chinese lunch I explained the situation and invited Bob to join the prospective review group (for which, as I told him, I already had two names). He at once accepted. Our final scientific team comprised Robert Carter, Chris de Freitas, Indur Goklany, David Holland and Richard Lindzen – three climate scientists and two engineers. They contributed a powerful review article, which appeared, alongside our economists’ critique, in the issue of World Economics dated December 2006. Not surprisingly, it provoked several highly critical responses, which the journal duly published; and these in turn gave rise to two separate rejoinders by the team which also appeared in the same issue. All three papers – the original critique and the twin rejoinders – read extremely well today. In 2009 Nigel Lawson established the Global Warming Policy Foundation; and he then set up for it, principally as a review body for publications, an Academic Advisory Council. Both Bob and I were founder members of this body, and as its chairman I had frequent interactions over the following five years with the more active of my new colleagues among whom Bob was numbered. His comments and responses were unfailingly prompt and helpful. He also became a GWPF author, in a report (co-authored with Willem de Lange) which Andrew Montford has rated as ‘one of the best things GWPF has published’. What he did for the Foundation was the more notable because it represented an additional task: it has to be seen in the context of his continuing major contributions of which others have written. The last time I was in touch with Bob was in November 2014, when he sent me a kind and much-appreciated note on learning that I had stepped down as chairman of the Council. I wish I had been able to see more of Bob before his untimely death. I miss him very much. Bob was at the World Federation of Scientists meeting in Erice, Sicily last August, where I had the pleasure of meeting him and Anne. Bob was wonderful and energetic. Intelligent, kind, and full of life and love of science. Bob and Anne are just absolutely wonderful charming lovely civilized people. In prior email conversations, Bob was always measured and never polemical. In his company I felt immediately at ease. His gaze was direct and his smile was genuine right up into his eyes. He paid attention and granted respect to everyone. At Erice, he gave an energetic, entertaining, and fascinating extemporaneous talk about the geology of Sicily. It was a pleasure to attend. Bob was immediately in support when I was aggressively attacked after my talk on negligence in the air temperature record. He instigated a “we’re-with-you” toast to cheer me up at our table during dinner later that evening. Bob Carter was a terrific guy. What a loss now he’s gone; what happy fortune to have met him. What good fortune to have had him with us.